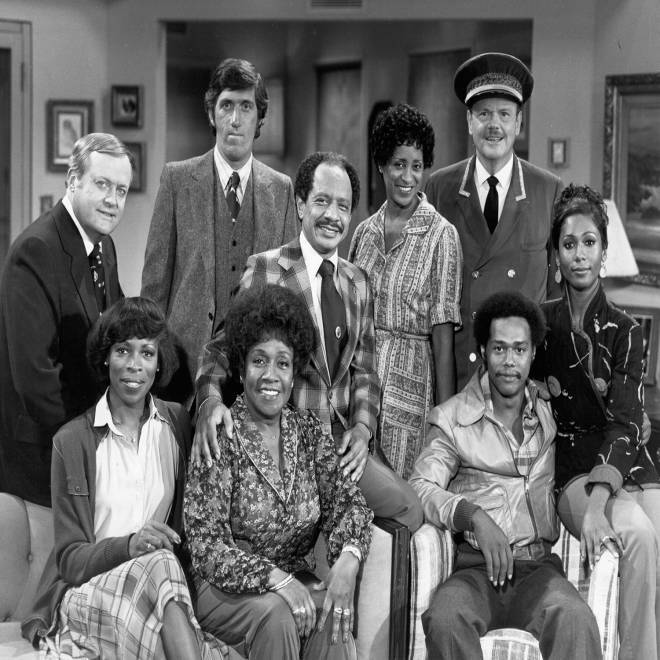 The cast of the TV sitcom 'The Jeffersons' (L-R Back Row: Franklin Cover, Paul Benedict, Sherman Hemsley, Marla Gibbs, Ned Wertimer and Berlinda Tolbert, Front Row: Roxie Roker, Isabel Sanford and Mike Evans) circa 1975 in Los Angeles, Calif. In 1970s sitcom America, George and “Weezie” Jefferson were able move on up from a derelict neighborhood to Archie and Edith Bunker’s working-class neighborhood and then, finally to a deluxe apartment in the sky on Manhattan’s wealthy East Side. They were finally getting their piece of the pie. In today’s real America, it’s not that easy. Since the 1970s, income inequality in America and “the hollowing out of the middle class” has increased at an historic rate. And now there is new research, published this week, showing that when it comes to the chances that a poor child born in America can climb up from the lowest rungs on the economic ladder, where that child lives may be more telling than previously thought. The researchers started by looking narrowly at questions of tax policy for poor parents, when they discovered something surprising but unmistakable in their data. That climb, the study shows, happens most commonly in the Northeast and the West, along with parts of the upper Midwest and much of Texas. New York, Boston, Seattle, Salt Lake City and Houston give a poor child a decent fighting chance. (In the map below, lighter colors indicate higher mobility; darker colors indicate lower mobility). The odds of children from poor families moving into the middle class are significantly lower in the Southeast and industrial Midwest. Atlanta, Charlotte, Memphis, Raleigh, Indianapolis, and Columbus are some of the metropolitan areas where upward mobility seems to be seriously limited. NBC News spoke with Hendren via telephone. Hendren: Yes, what the study suggests is that it matters where you grow up. The extent to which people rise out of poverty varies a lot across areas, and in ways that, to be honest, we don’t fully understand. Were you surprised that geography seemed to be so strongly correlated with the ability to move up the economic ladder? Yes. What surprised us was the extent to which people from poor backgrounds in different areas earn different amounts and have different economic outcomes. What that suggests to us is that there are places out there that are good at helping people rise out of poverty. What we hope is that future researchers will use the data and think about what it is about place that makes it effective at getting people out of poverty and making them more economically mobile. You found there are some factors that set upwardly mobile cities apart from others: a large and geographically dispersed middle class so that lower and upper classes live among one another; good schools; a high share of two-parent households; and populations engaged with religious and community organizations. If every area had those four things, would economic mobility be greater? Difficult to say. I think what we identified are things that are characteristic of places that are upwardly mobile. What that calls us to do is understand why those areas are good at helping people rise out of their parents’ economic situation. The study also suggested that mobility has its upside: for rich people. People born into relative wealth seem to stay wealthy, and they don’t seem to have a big risk of falling down the ladder. People at the top do do better than people at the bottom. That certainly comes through when we do look at the data. What is the message, then, for lower-income people who are trying to do everything right, yet who happen to live in any one of the places where you have found there can be very little economic mobility? Are they doomed? I guess that is one way to look at it. But the flip side is to say there are places that are good, and the direction we encourage other people to think about is, what is it about a place that really makes it more mobile and helps people pursue the so-called American dream? How can more cities be as mobile as places like San Francisco, Salt Lake City or Houston ? I think you’re asking the million-dollar question. A nationwide study found one's ability to earn more over time is much lower in some parts of the country than others. NBC's Mike Taibbi reports.